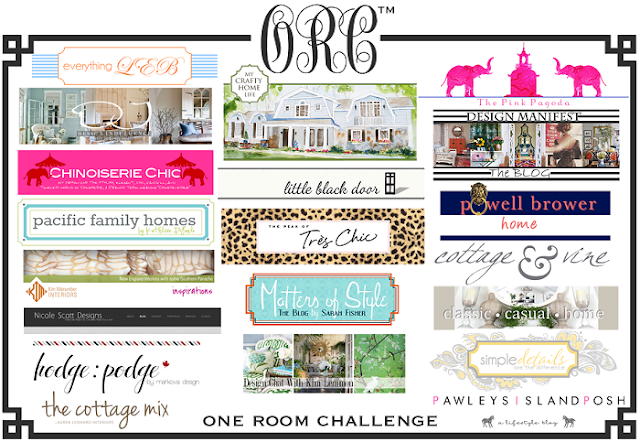 Welcome to the final installment of the One Room Challenge, where 20 bloggers attempted to re-vamp, renovate and re-do a space in 6 weeks. Did we do it? Be sure to visit the bloggers (links at the end of this post) so see if they did! Want to see where I began? Pop over here. Did I manage to get it done? I managed to tidy up the space, hang up a gallery wall, add pom-pom fringe to the drapes, sew a smallish pouf, shop the house for pillows and a vintage Coke bottle carrier turned tray, added Panyl to the back of my Billy bookcases and bought a small coffee table for the space. I did not find a rug. Cheapskate me hit Ikea in hopes of finding the perfect rug. I have champagne taste on a beer can budget. Hand tufted wool rugs were what caught my eye, but the price tags deterred me. All the cheapo rugs were, well...cheapo. I am a texture and fabric snob, couldn't bring polypropylene into my house. Sigh..... so no rug. Will keep looking. My Panyl pieces arrived and were so easy to apply! Panyl is an amazing product, it has a really neat "stick" to it. If you don't like how you placed it, you can re-apply it. It goes on smooth, with no wrinkles or bubbles. I am excited to use it again! 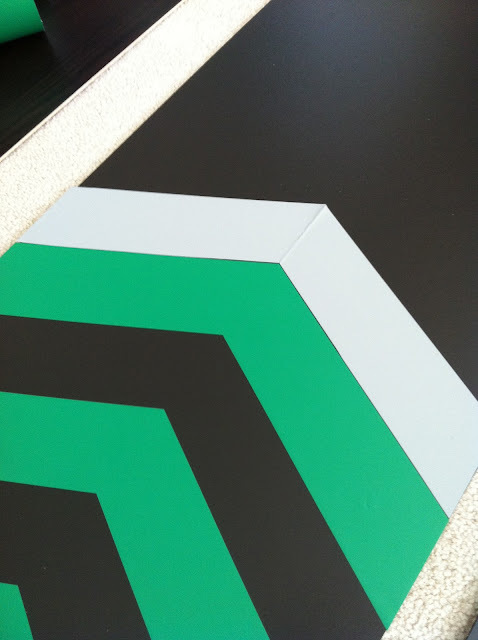 The only downfall was I assumed the Panyl pieces were green and white, like they appeared on their website, and did not realize that those were strips of Panyl on a white bookcase with a white back. Had I known that I would have painted the back of my bookcase for more pop. I like the green, but green and white would have been better. So when the weather warms up, I am taking apart the bookcase again to paint the back and re-apply the green Panyl stripes. Ready to see the room? Here are the sad before shots. Feels good to be done! Love it Barb! This room is sooooo inviting. Im going to come watch a movie in there with you and soak it all up. Way to go with all the details. It really makes the room. hope youre enjoying your break! Beautiful room!!! Thanks! The whole time I was photographing this space I had to keep the dog away from the popcorn! What a fab playroom! I'm loving all of the details here, and the PANYLs look great- they totally make those bookcases look custom. Such a beautiful space now, I just want to curl up on the sofa, turn on a movie and munch on some of that popcorn! 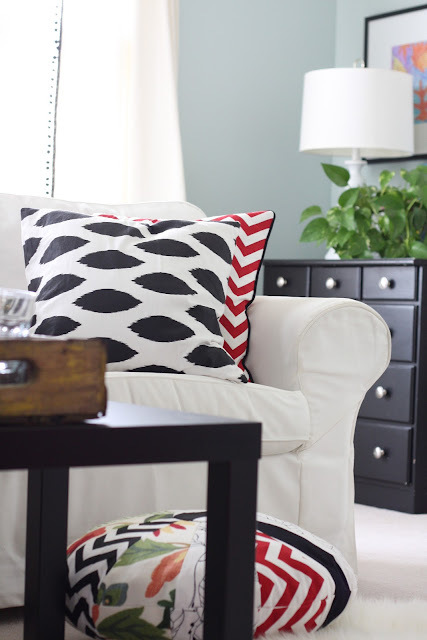 It turned out great - I love the pom pom trim, the pillows, and the striped bookcases. A wonderful transformation. Don't let the kids into this space. This should be the adult retreat. Tell them to go outside, that's what my mom did. This is beautiful, crisp, clean and just lovely. I really like how you balanced it, and boy can you style a Panyl pimped bookcase. That popcorn is calling my name. oh barbara -- this is wonderful! i just love the crisp pops of color. BRAAAAAAAAAAAAVO! That's an awesome change in 6 weeks! 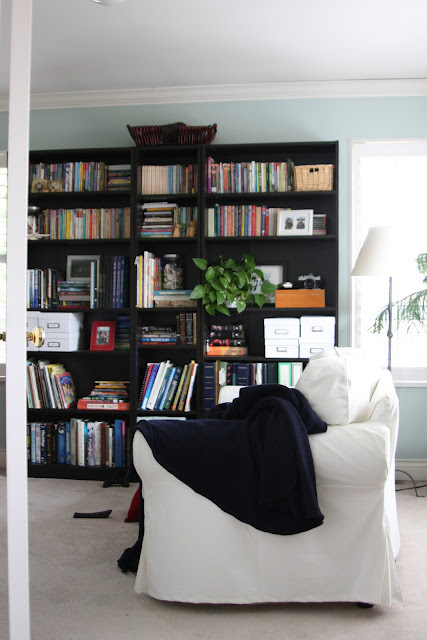 That pom pom trim makes the space so playful - and I love the panyl on the back of the bookcases! Looks great Barbara! 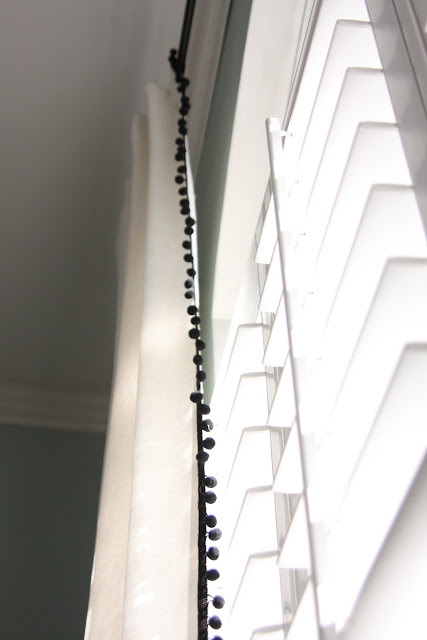 I'm dying to do pompom trim somewhere - and I love the contrast against the white curtains. Great styling, too! Woooohoooo! Great job and congrats on finishing the challenge with flying colors. I'm loving the pom pom fringe. That is one stylish room for the kiddos!! Your styling is perfection! 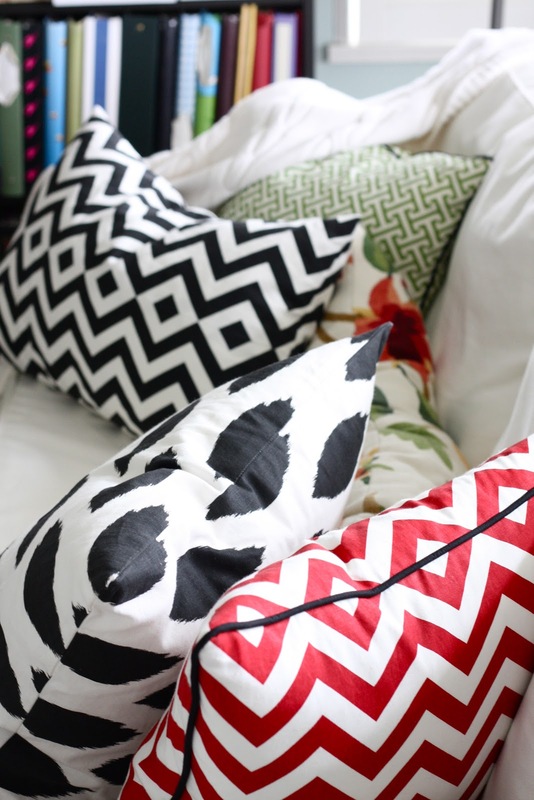 Love all your fun, vibrant choices combined in such a sophisticated way! The Panyl looks great as a background for the bookcase, too! Your space looks terrific, Barbara! Well done. 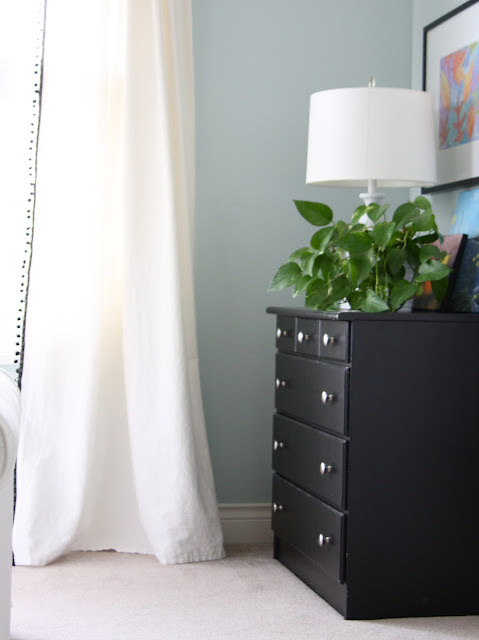 The pom pom trim is so sweet, and the gallery is bright and cheery. I love the fun vibe that's going on. Hugs. What a fun play room! I'm still dying over the pouff & the beautiful art made by your daughter. So cheerful and vibrant! cool room! i love the backing you did on the book case, perfect! I bet you are so please with your work, great job! Looks awesome! You'll find the rug when you least expect it, in the meantime the updates you have made really make for an inviting space to hang out, nice work! 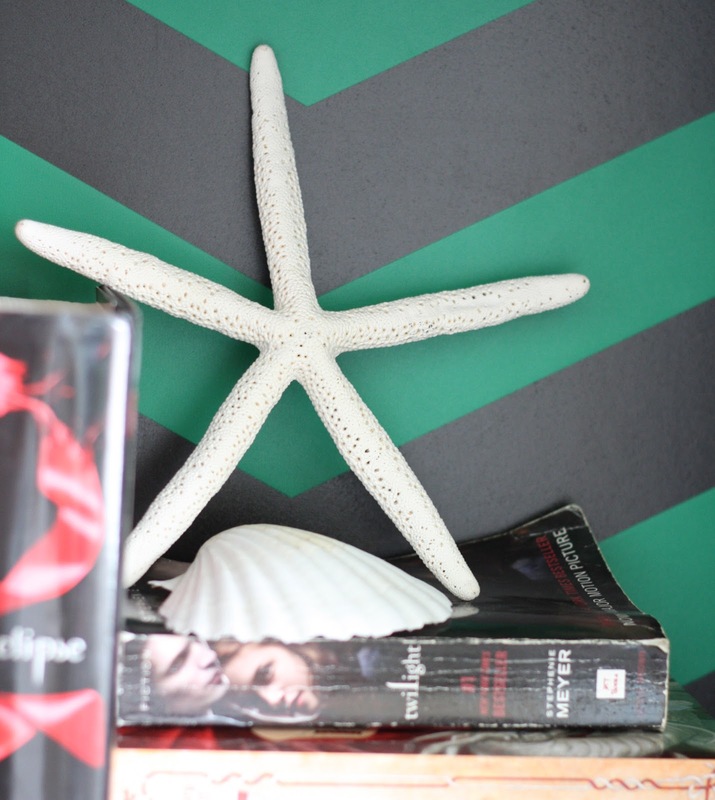 Love the back of the bookcase, those stripes look very cool! The curtains and pouf look fabulous! Great job! Such a fresh and happy room...making me wish I was over there for some popcorn and a movie. Glad you didn't settle for a rug...I think you'll find the perfect one and love it. Excellent job on the stylish bookcase. I love the mix of red, white and black! That console looks amazing! Love it all. 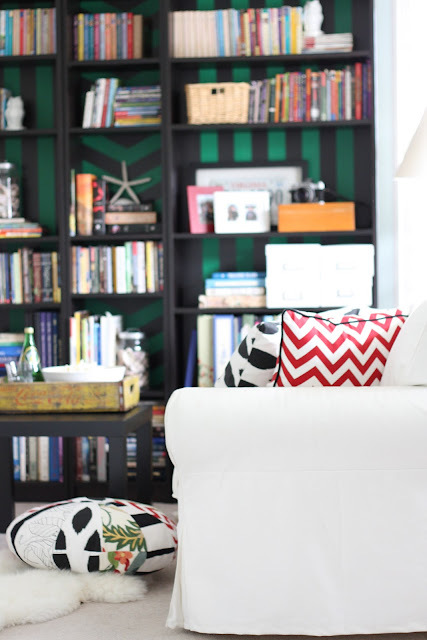 All the pattern, and that well styled bookcase - awesome. Great work!! It looks so great! 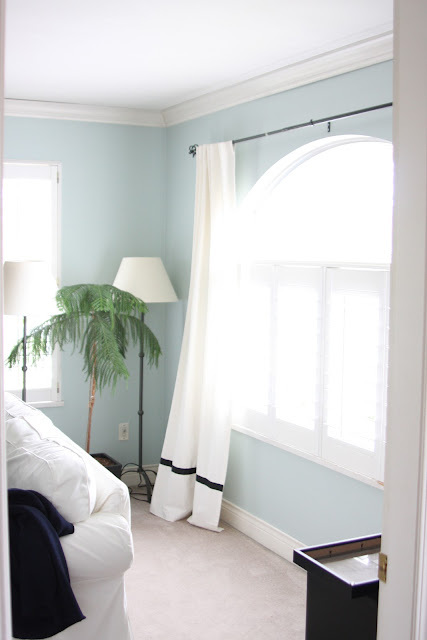 The trim on the curtains is perfect! Great job! And I totally appreciate your decision on the rug - the right one will come along, and you'll be so glad you didn't settle. Now go and enjoy that space - you deserve it!! The room looks GREAT!! I love green and black, but green and white will be gorgeous and I can't wait to see! I love everything you did, Barbara! ahhhh..so awesome! fave...curtain trim cushions coke tray red entertainment piece...very fun & so stylish! I am so happy you are on break and obv enjoying that wonderful room! It looks soooo good, Barbara! I love the colours and am still so amazed by that pouf you made. Great job! First of all....love your photography! You got some great tight shots of all the details! The room is perfect and the Pom Pom trim looks great on the curtains! Good for you to wait until you find the perfect rug....wise woman! Congrats on pulling it together! Beautiful Job! I am loving the red! 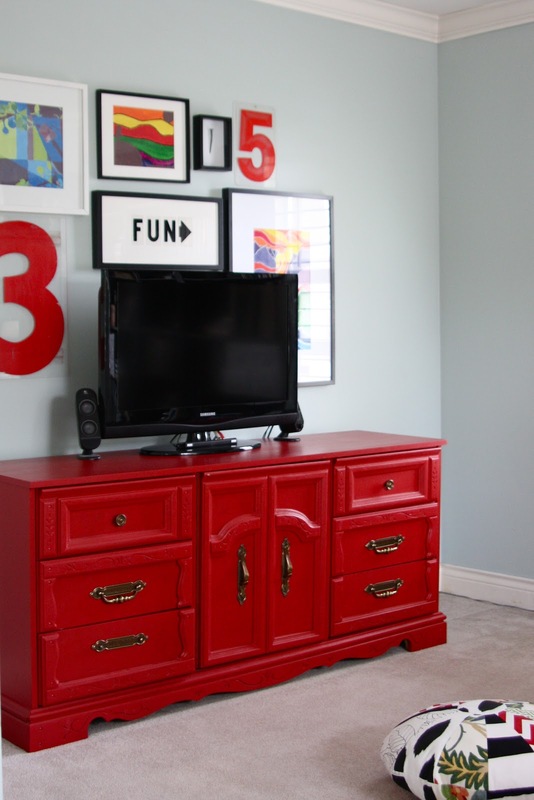 Looks like a great space for the whole family to hang out in with the fun colors and personal touches. I'm going to check out that panyl stuff you added to your bookcases. I'm looking for something to add some life to my bookcases. Enjoy your weekend! Your room looks so beautiful - wow, wow, wow! You've done a wonderful job Barbara!! Mmm! LOVE! What a gorgeous room, Barbara. The patterns, the colors. So awesome! I'm big on finishing touches and right away I noticed the black piping on the pillow and the trim on the window treatment. Nice touches. Bet it feels good to have a finished space. All the details! The pom poms on the curtains! I love it. It looks amazing and cozy and inviting. You did a great job with it! Great job! I'm super curious about that Panyl stuff - would be great to see a wide shot of the bookshelves! Well, if you had an email connected to your profile I could email you a wide shot. I am writing up a review post though, stay tuned! wow! those colors are all so amazing together.... i am in love with the red piece- it looks stunning! Great job!!! I love the colors! it looks fantastic!! I love that graphic backdrop a the bookcase and that gallery wall around the TV looks so good! Looks so amazing! I LOVE the little gallery wall behind your TV. Fantastic job! It looks so great!! While reading I was thinking I should comment on THAT, and THAT, and THAT....and it just got to be everything. Itblooks awesome. Well done, and your photos look fantastic. Barbara, looking fantastic and very Scandinavian! Yes, really! I am with Sherry, you are also really good with the camera. Save some popcorn. We are heading to Vancouver in the next few weeks. Will call beforehand. I love the green on the back of your shelving. And want your pillows! Room looks so cozy and colorful. GREAT Job! Great job on the room Barb!! I love the Panyl things on your bookcase, gorgeous. It all looks really, really comfortable and liveable. Love the room! 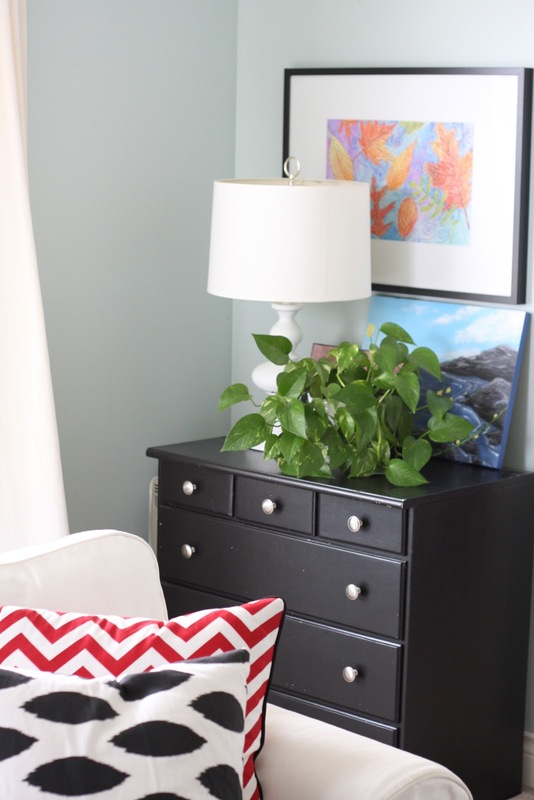 What is the brand and color of the red painted dresser? Glad you like it. The brand is Benjamin Moore and the colour is raspberry truffle.